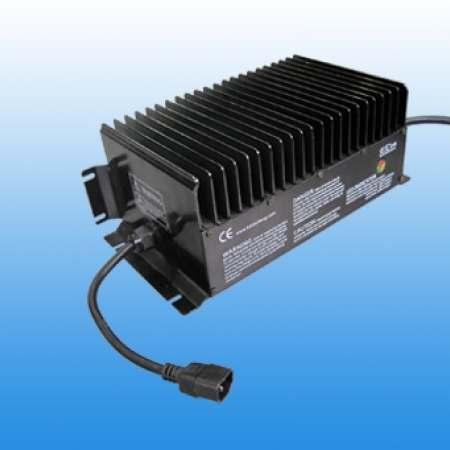 E-PFC2500W - Lithium Storage Inc. | Lithium Storage Inc. Contact us for volume rates! 1. Free custom programming to your exact requirements included with every charger. Also free email technical support and half-price reprogramming for the life of the charger. 2. Internal integrated PFC, no pollution to electric network, minimizes disturbance on electric network from heavy current. 3. Wide input voltage range AC85V~AC265V available for worldwide requirements, convenient for electric-network fluctuation and vehicles exportation. 4. High efficiency, above 93%, while traditional chargers can meet only about 80% efficiency. 5. Intelligent temperature compensation function in the charging process, preventing damage to the battery caused by charge-off or charge due, greatly extending the lifespan of the battery. 6. Fully-sealed and water-proof, protection class IP46. Shock resistance treatment made inside makes vibration-proof level up to SAEJ1378 that can fully meet the standard of automobile appliance usage. 7. Available for various kind of batteries like Lead-Acid, LiFePO4 etc., Flexible and programmable charging module. Ability to select 10 different Amp Hour or Cell Count settings. Equipped with CAN communication interface to realize real-time communication with BMS. Note: red = in stock, black = special order.